• Seldom available extended detached family home set in a desirable location with excellent river views. An exceptionally spacious property comprising of a reception hallway, lounge, dining room, kitchen, utility, WC, three bedrooms, luxury en-suite and luxury bathroom and office/bedroom four. GCH, drive, garage and gardens. A rarely available extended detached family home set in a desirable and sought after location within the picturesque coastal town of Gourock. 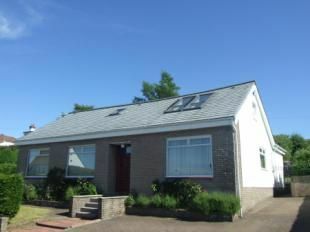 The property is ideally located for popular primary and secondary schooling as well as local shops and transport links for destinations further afield. Furthermore, the property commands excellent aspects to the Firth or Clyde and beyond from the upper level accommodation. This is an exceptionally spacious property which has been modernised and extended with the upper level of the property having been developed to create an upper gallery hallway, master bedroom suite with an extensive dressing room and a luxury en-suite bathroom. This property is sure to appeal to a variety of discerning purchasers due to its location and accommodation on offer. The accommodation comprises of welcoming reception hallway which leads into a bright spacious lounge which then flows into the dining room. There is access into the substantial modern fitted kitchen and there is further access into the kitchen from the reception hallway. There is ample storage in the form of both base and wall mounted units within the kitchen as well as a range of integrated appliances. There is a serving hatch between the kitchen and the adjacent dining room. The property further benefits from a substantial utility room, again offering extensive storage in the form of both base and wall mounted units and next to the utility room is a w.c with an adjoining sauna. The lower level accommodation further features two double bedrooms and a luxury family bathroom which comprises of a double Jacuzzi bath, a low level w.c and a wash hand basin. Specification also includes a feature illuminated mirror, laminate ceiling with halogen down-lighters, Amtico flooring and a heated towel rail/radiator. Access to the upper level accommodation is via the office/bedroom and this area has been fitted throughout with high quality bamboo wooden flooring and wall panelling as well as a bespoke staircase leading to the upper level accommodation. As previously described the upper level comprises of an upper gallery hallway with two substantial Velux windows which allows you to fully appreciate the river views on offer. The right hand Velux window opens out to form a small balcony. The master bedroom, dressing room and en-suite are a particular feature of this property with the large en-suite comprising of a substantial shower enclosure with wall mounted power shower, wash hand basin with associated bathroom furniture, low level w.c, Amtico flooring and a heated towel rail/radiator. The room has been laid throughout with high quality flooring and the specification, includes a laminate ceiling and halogen down-lighters. There is access to further storage from the en-suite shower room. The dressing room adjacent to the master bedroom suite has been fitted with wardrobes and bedroom furniture. This room could also be utilized as a nursery depending on the needs of the prospective purchaser. Lounge22'11" x 14'7" (6.99m x 4.45m). Dining Room10'10" x 7'5" (3.3m x 2.26m). Kitchen15'1" x 10'10" (4.6m x 3.3m). Utility Room11'7" x 9'11" (3.53m x 3.02m). Bedroom One18'3" x 18'7" (5.56m x 5.66m). Dressing Room16'5" x 9'7" (5m x 2.92m). En-suite15'9" x 13' (4.8m x 3.96m). Bedroom Two14'3" x 11'5" (4.34m x 3.48m). Bedroom Three11'6" x 11' (3.5m x 3.35m). Office/Bedroom10'11" x 10' (3.33m x 3.05m). Bathroom10'11" x 6'2" (3.33m x 1.88m). From our office in West Blackhall Street proceed onto Dalrymple Street to Gray Place, continue through the traffic lights onto Broughem Street and follow directions to the centre of Gourock. Continue through Gourock on Cardwell Road turning left onto Larkfield Road followed by first right onto Broomberry Drive. Continue along Broomberry Drive to the junction at Barrhill Road, thereafter, turn left on Barrhill Road and continue into Victoria Road, eventually turning left into Golf Road. Continue up Golf Road turning right into Cowel View where the property No 1 is immediately located on the left hand side.